The annual Deck the Falls ceremony in Cannon Falls commences, officially kicking off the holiday season. 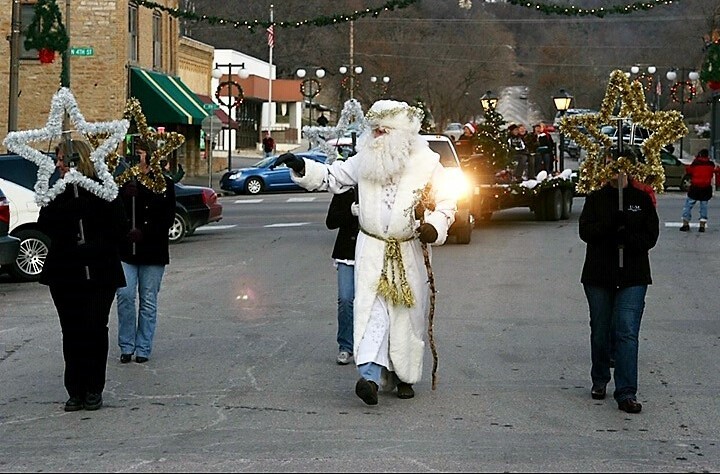 On Saturday November 24th the streets of Cannon Falls were filled with holiday magic for the annual “Deck The Falls”. Characters from the Holiday movie favorites such as Frozen and The Polar Express made appearances alongside other classic characters such as Father Christmas and Santa Clause. The parade has been a tradition for many years now in Cannon Falls, but there’s more to Deck the Falls than just the parade. Prior to the parade, Santa Clause paid a visit to the Hi Quality Bakery. Kids and parents had the opportunity to take pictures with the jolly fellow for free. Throughout the day many businesses offer special deals and prices on items in an effort to boost their revenue for the day. Finally, another major part of the event comes after the parade is over: the lighting of the Christmas Tree. After a countdown, the crowd gawks from across the river at the magnificently lit tree, while they enjoy a nice warm cup of apple cider. However, accomplishing all this would’ve been a lot harder without the help of the many student volunteers. With the parade all wrapped up, many are ready to head into the holiday season merry and bright. However, without the help of volunteers like Kristina and Ryan, the event wouldn’t have been nearly as jolly.